the race for the IMOCA Open 60 fleet became more tactical as they seek the best lanes of breeze, gybing downwind 150 miles north of Madeira and the pair of MOD70s were passing the latitude of the Canary Islands still making regular speeds of 23-25 knots. 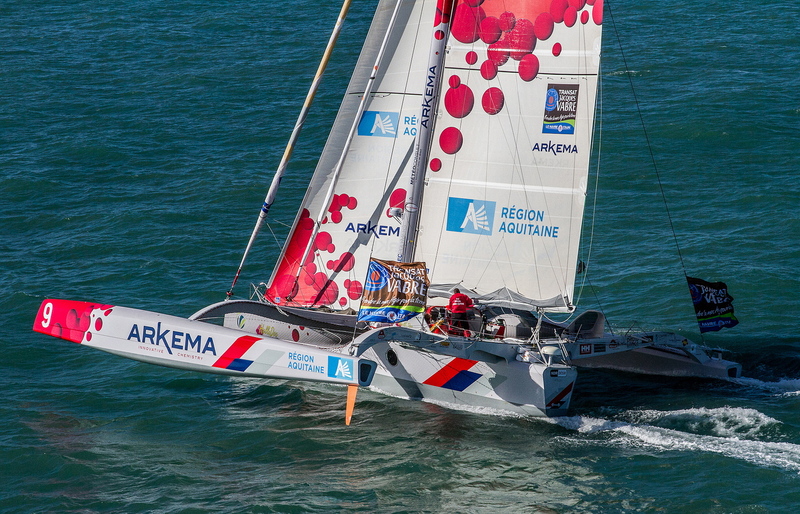 After capsizing in gusty, shifty tradewinds when they broached 220 miles west of Lisbon late on Sunday night, the French co-skippers of Arkema-Region Aquitaine, Lalou Roucayrol and Mayeul Riffet, dived under their upturned Multi 50 trimaran today to free their broken mast and tidy what they could with a view to being towed towards Lisbon. The duo have returned inside the boat, are safe and well, taking turns to rest and eat and keep a careful watch to avoid other craft colliding with them. Their technical team arrive in Lisbon at 1800hrs UTC this Monday evening where they have a tug on standby, ready to leave at 1900hrs. They should arrive in the zone tomorrow morning. “The wind was blowing at between 12 and 18 knots, and the boat broached with the rudders slipping and in three seconds the boat was upside down. We wanted to ease the sails but it was much too late. We were sailing under gennaker so it dug in. I was inside and tried to get out, but couldn’t. "Lalou (Roucayrol) arrived by swimming underneath and came in through the little hatch. Everything is fine and we’re currently organising the towing arrangements to get us back to Lisbon. We don’t know whether the boat will be towed upside down or righted. We can suppose that the mast is broken. At the moment we have 15-17 knots of wind. Express pit stops were signalled today by the class leaders in both the Multi 50 class and Class 40. The fact that both Actual (Yves Le Blévec and Kito de Pavant) and GDF SUEZ (Sébastien Rogues and Fabien Delahaye) extended their respective leads in the Multi 50 and Class 40 divisions will certainly help their challenge when they stop to make fast repairs. 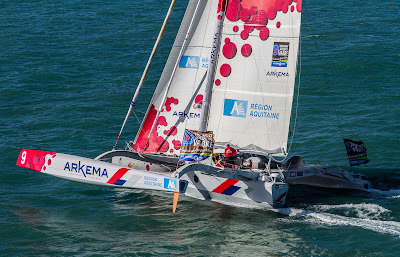 Actual which leads the Multi50 fleet now by 68.4 miles ahead of FenetreA-Cardinal (Erwan Le Roux and Yann Eliès) have said they plan to stop in Madeira and had less than 60 miles to the island on the 1500hrs UTC ranking this afternoon. They aim to replace their wind instruments at the top of their mast. That is the same key repair that the Class 40 leaders aim to complete on the NW Spanish coast. They were about 60 miles off the coast on the same 1500hrs ranking but were making 9 kts. Three other Class 40’s announced during today that they will stop too. Alex Pella and Pablo Santurde on the Spanish designed and built Tales Santander 2014 in eighth place are heading into La Coruna with a rudder problem. They damaged the bearing of their starboard rudder when it took a shock. They are awaited tomorrow morning but can give no indication how long the repair might take. The British-American duo on 11th Hour Racing Hannah Jenner and Rob Windsor are returning towards Lorient after their forestay failed dumping their Solent headsail into the water. Luckily they managed to save their rig. There were lucky escapes too for both BET1128 which also dropped their mast when their Solent hook failed, and also for the British duo on Caterham Challenge, Brian Thompson and Mike Gascoyne, who were racing close enough to the Italian-French duo Gaetano Mura and Sam Manuard that they had to alter course to avoid BET 1128 when the mast fell backwards. BET 1128 re-set their mast using a combination of halyards and lines but will also make a halt to repair the failed swivelling hook and some damaged electrical cables inside the mast. 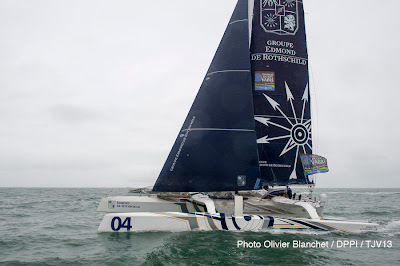 In second place the German-French duo on Mare, Jorg Riechers and Pierre Brasseur have a good chance to take the lead in the Class 40’s when GDF SUEZ stop. They were 21 miles behind the pacemakers this afternoon. Thompson and Gascoyne were up to eighth today with a deficit of 56 miles while Ned Collier-Wakefield and Sam Goodchild lie 11th. 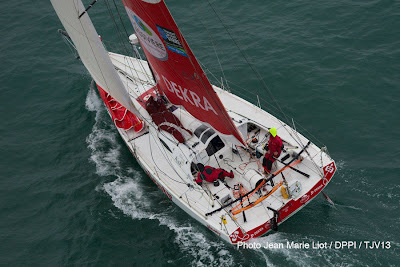 As expected it is the group of five newer boats which are well away from the second half of the fleet now. First to gybe to the south early this morning was Safran, Marc Guillemot and Pascal Bidégorry who gained a better heading and more wind pressure to lead this evening by 15 miles from PRB, Vincent Riou and Jean Le Cam. 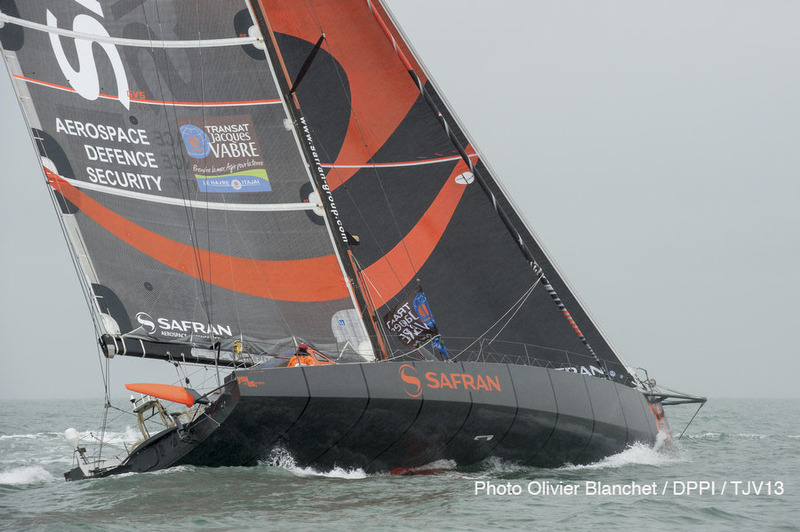 After their four hours pit stop in Peniche, Portugal to replace a damaged rudder blade on Sunday afternoon, Francois Gabart and Michel Desjoyeaux on MACIF lie fifth, looking to make back the 56 miles they lie behind Safran. The leaders of the MOD70 fleet had about 500 miles to race to pass the latitude of the Cape Verde Islands. 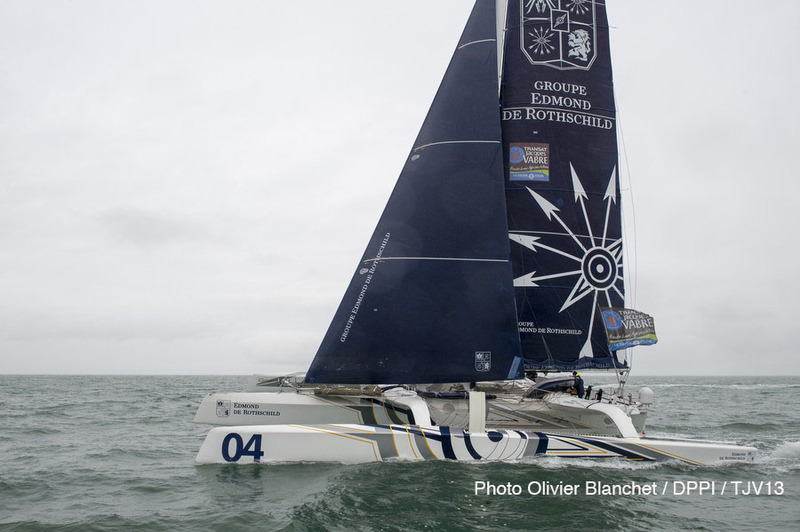 Sébastien Josse and Charles Caudrelier on Edmond de Rothschild polled another profitable day’s run on 572 miles with a suggestion of an ETA to Itajaí of 20th November. Both duos had alread indicated they expected to take between 12 and 14 days. Although they were 87 miles behind their rivals Oman Air - Musamdam are fighting back: "We have changed some settings of the boat during the last six hours and now we're a little faster. A few problems added together and made us lose a few more miles but we are doing well and we hope to catch up. There is still a long way to go, " Skipper Sidney Gavignet reported this evening. François Gabart skipper MACIF (IMOCA) "We are going downwind fast. We try to catch up with our rivals. They didn’t hang about and wait for us while we made our short stop in Portugal and they were right. Our damage happened when we were off Cape Finisterre in slightly lighter conditions. Our starboard rudder broke. Both rudders are identical aboard MACIF so we swapped them over. And then we made the technical stop in Peniche to fit the spare one. It would not have been very great to go to across to Brazil with one rudder."